Artists, illustrators, and designers of all kinds rely on Wacom's line of drawing tablets. Up until now, the devices only worked as peripherals. But Wacom's new line of fully self-contained tablets are the only devices you need to make art just about anywhere. The Cintiq Companion is Wacom's attempt to integrate its own powerful stylus & tablet technology into a fully-featured mobile device. It comes in two different varieties. 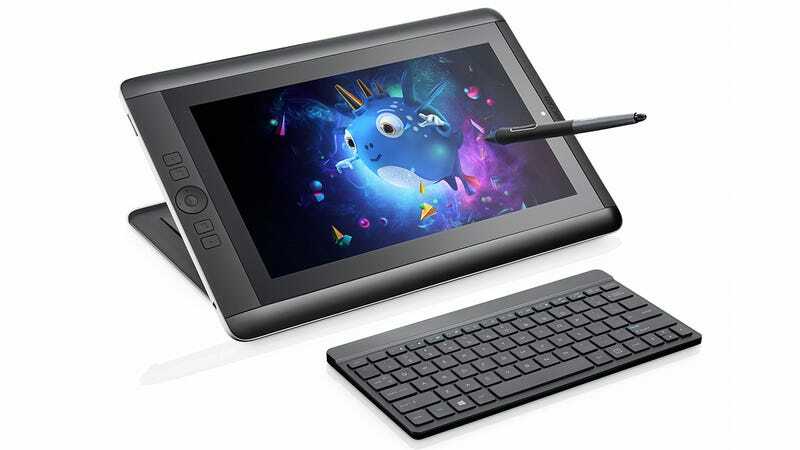 The first, simply the Cintiq Companion, will run Windows 8 with a 13.3-inch, full-HD 1920x1080 display and, of course, will include the Wacom Pro-Pen with 2048 levels of pressure sensitivity (same as the popular Jot Touch). On the inside is 8GB of RAM, a 3rd generation Intel Core i7 processor, and Intel HD Graphics 4000. The second model is the Cintiq Companion Hybrid. This will work just the same as a traditional Wacom Cintiq when connected to your computer, but when disconnected it will run what sounds like a heavily skinned version of Android Jelly Bean, with what Wacom describes as "enough power for light sketching." The Hybrid features the same 13.3-inch HD display, and runs an Nvidia Tegra 4 processor with 2GB of RAM, 16 or 32 GB of disk space. It's great to see Wacom harnessing its technology in devices that are more versatile than their other tethered offerings. However, making a successful high-performance tablet is not necessarily easy for a company on the first try. The Companion Hybrid particularly could be a hard sell if the Android experience is too limited due to proprietary software and lack of horsepower. The benefits of Wacom's unique stylus and touch controls will have to justify the price tag, which is astronomical for a tablet nowadays. Both the Companion and the Companion Hybrid feature Wi-Fi, and Bluetooth, microSD slots, and front and rear cameras (2 megapixels/8 megapixels, respectively). You'll be able to purchase the Companion in October, with a 256 GB SSD running Windows 8 for $$2000, or with a 512 GB SSD running Windows 8 Pro for $2500. The Cintiq Companion Hybrid will be available in mid-September for $1500 (16 GB version) or $1600 (32 GB). In addition to Wacom's fancy new tablets, it's also announcing a new pressure-sensitive stylus that you can use with an iPad. The Intuos Creative Stylus uses Bluetooth 4.0 and 2048 levels of pressure sensitivity to provide a more life-like drawing experience. It will be compatible with Wacom's own Bamboo app, as well as a number of third-party apps like Autodesk Sketchbook Pro and Procreate. The Intuos Creative Stylus will launch in early October for $100.